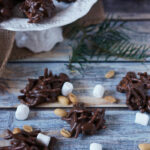 These rocky road haystacks are always a hit. 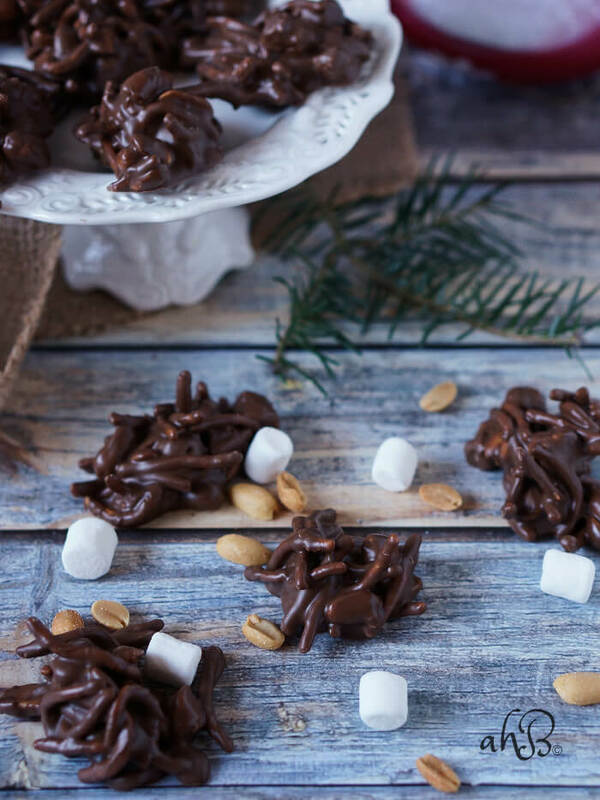 Crunchy peanuts and chow mein noodles are paired with mini marshmallows and coated in chocolate for a sweet and salty no bake treat that’s quick to whip together. 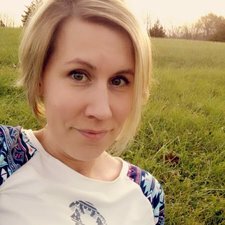 It’s funny to me the different things we care about having the “best of.” Not necessarily funny in the haha kind of way, but funny as in peculiar. For instance, my husband has to have the best internet. He’s constantly checking our download and upload speed, changing our routers, our modem and service providers so that we have “the most face melting fast internet.” Those are obviously his words, not mine. I love these rocky road haystacks because they totally fit into the category of fantastically delicious, easy, and so little clean up. 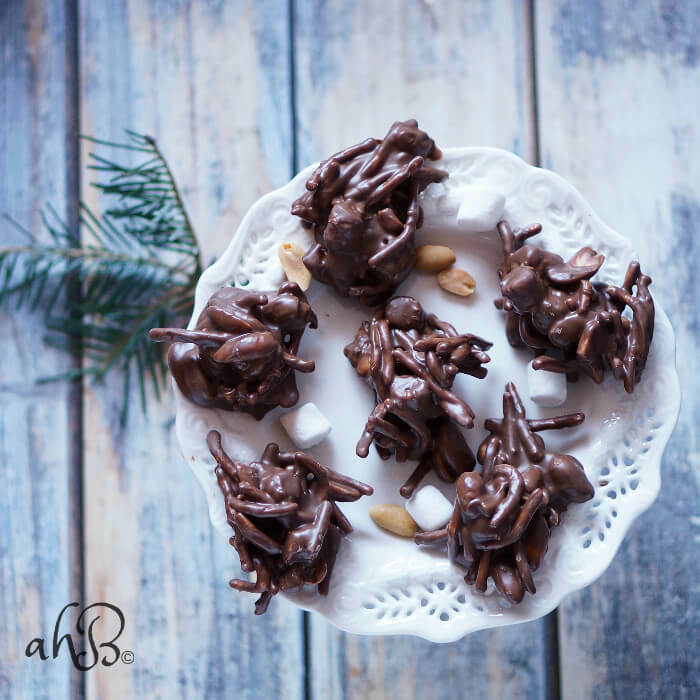 Plus these haystacks fit into the category of no bake cookie and Christmas candy. Win, win, win. All the way around these rocky road haystacks are just good. Traditionally haystacks are no bake cookies made with a candy coating and a long, skinny crunchy component, such as potato sticks or chowmein noodles and some kind of nut added. So when they set up, they actually look like a haystack. I love adding mini marshmallows to mine. The soft and chewy marshmallows with the crunchy and salty makes a perfect combination. If you have a peanut allergy this recipe is easy to modify. Just switch the peanut butter and peanuts for almond butter and almonds. It will taste just as wonderful! 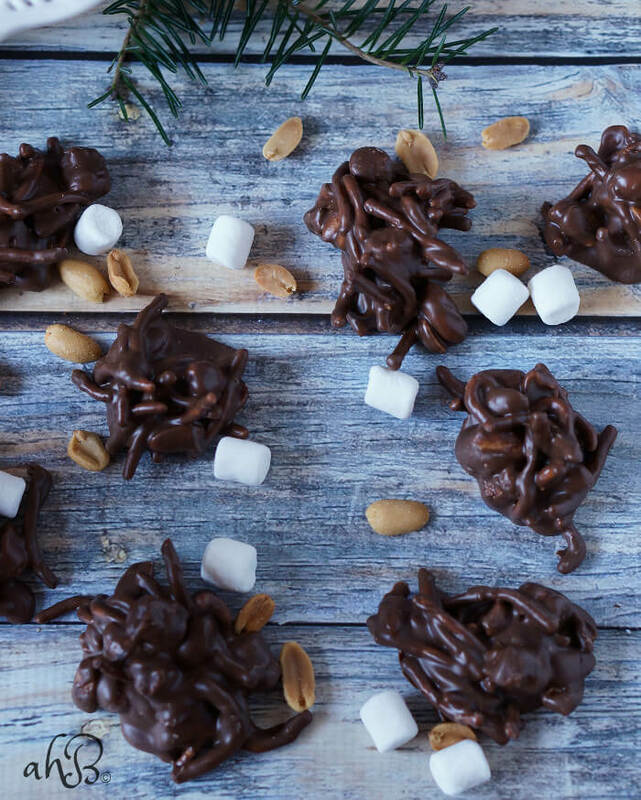 Crunchy peanuts and chow mein noodles are paired with mini marshmallows and coated in chocolate for a sweet and salty no bake treat that’s quick to whip together. Heat the almond bark in a double boiler or in the microwave until melted. Stir in the peanut butter until it's completely mixed in. Stir in the peanuts, chow mein noodles, and mini marshmallows. Drop by teaspoonfuls onto waxed paper and let cool until set. I love these haystacks! Marshmallows would add a great touch. Like the idea of something other than pretzel sticks, too. Happy Christmas to the Dickersons! May you have a fantastic year, too. Thank you so much Rosina! Happy New Year to you and your family as well!